Here's a new "workshop" recipe to support groundbreaking research and teaching: create spaces for six faculty members from two universities and multiple disciplines to (a) introduce their research to each other and exchange insights and advice, (b) consider together how their individual perspectives might converge, and (c) pair up for public conversations about three topics that affect everyone, including people in the LGBTx communities. "We wanted to support the kinds of intellectual exchanges that lead to deeper and wider understanding of LGBTx issues," said co-moderator John Donahue, Dean for Educational Policy. "Participating faculty shared generously with each other, and their public presentations offered students a rare inside look at the kinds of thinking and discussion that inform scholarly research." The workshop was held March 15 and was co-moderated by Donahue and Kelly Joyce, director of the Science, Technology, and Society program at Drexel University. It was hosted by the Boswell Initiative, and funded in part by the Arts & Sciences Annual Fund. Several themes emerged over the course of the day, as the faculty shared their current research and found areas of common ground and intersection. 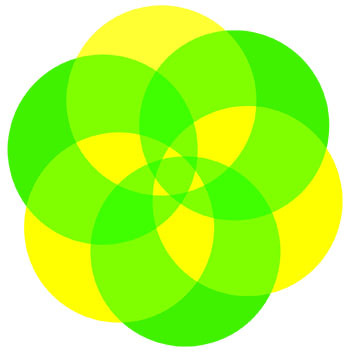 What determines membership in a cultural or demographic "group," and who makes those decisions? In the backlash after 9/11, American Muslims and residents with backgrounds in the Middle East and Southeast Asia found themselves marginalized in ways that led them to form supportive cultural groups they hadn't sought out previously. The European Union mandates refugee asylum on the basis of sexual orientation — but the member countries have different ways of determining who is and isn't really "homosexual." And what about the alphabet soup of LGBTQIAPK and other variations meant to be inclusive? Do all of these categories really form a group, or is that a convenience or misrepresentation? Maybe it would make more sense, if we're talking specifically about Lesbians, to just be clear about that. Conversations also considered the distancing and alienating practices that can be experienced by patients in medical settings vs. the "problem-solving" orientation of public health. What might we learn if health practitioners and policy-makers leaned the other way in their approach, slowed down, and looked at the broader picture of patients' lived experiences? Birth control pills and the HIV prophylactic PrEP are marketed as ways people can gain agency over their sexual activity and reduce unwanted consequences — by taking drugs that are expensive, might or might not be covered by a health insurance plan, and bind the users to a daily pill regimen that profits the pharmaceutical industry. 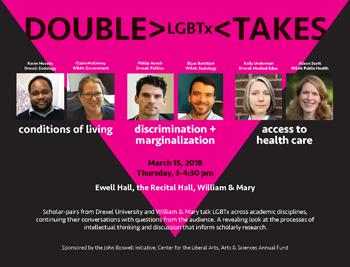 At the afternoon Double >LGBTx< Takes presentation attended by students, in paired conversations and as a panel, the faculty addressed three areas (conditions of living, discrimination + marginalization, access to health care) and responded to students' questions. The student Flat Hat newspaper article covered the afternoon session in detail. Prof. Joyce offered this perspective on the workshop: "I can see why it is so important that W&M has (and every university needs) the Boswell Initiative. It keeps LGBTx ideas, research, and politics coming into campus in productive ways."